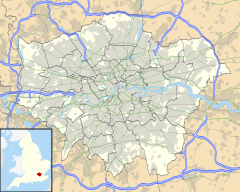 Bankside is a district of London, England, and part of the London Borough of Southwark. Bankside is located on the southern bank of the River Thames, 1.5 miles (2.4 km) east of Charing Cross, running from a little west of Blackfriars Bridge to just a short distance before London Bridge at St Mary Overie Dock to the east which marks its distinct status from that of 'the Borough' district of Southwark. It is part of a business improvement district known as Better Bankside. The 'banke' was reclaimed by the Bishop of Winchester who owned the manor of the Clink of which this is part. There is a map plan in the Duchy of Lancaster archive showing 'the way to the banke'. The name is recorded in 1554 as the Banke syde and means 'street along the bank of the Thames'. It is formed from Middle English 'banke' and 'side'. In 1860 Southwark Street was created to connect the Blackfriars and London bridge crossings here and that can be regarded as the area's informal southern perimeter. Bankside is the riverside of the former liberties of the Clink and Paris Garden. In the Elizabethan period, because of its location outside the jurisdiction of the City of London, the area of the Clink and Paris Garden were outside of the City of London's authority and so became occupied by the bear baiting pits and playhouses, including the Rose, the Hope Theatre, the Swan and the Globe Theatre of which a replica was constructed in the late 1990s. The history of the area is traced in a study that traces the earliest known history of a particular building on Bankside until the present day. It has experienced regeneration in recent decades, becoming a significant tourist destination, and forms a business improvement district. The skyline of Bankside is dominated by the former Bankside Power Station, which now houses the Tate Modern. A major new development in the area is the Bankside 1/2/3 complex on Southwark Street. Together, these three building house about 5,000 employees. Bankside 1, also known as the Blue Fin Building, was built-for and partially-occupied-by IPC Media, while Bankside 2 and 3 are occupied by The Omnicom Group Ltd. The architect for the buildings was Allies and Morrison. It is part of the Borough and Bankside Community Council which corresponds to the Southwark electoral wards of Cathedrals and Chaucer. They are part of the Bermondsey and Old Southwark Parliament constituency and the Member of Parliament is Labour's Neil Coyle. It is within the Lambeth and Southwark London Assembly constituency and the London European Parliament constituency. Since 1754 the Blackfriars Bridge formed a connection to the north and in 1819 Southwark Bridge has connected the area into the City. In 2000 a direct pedestrian connection was opened between the Tate Modern and St Paul's Cathedral via the Millennium Bridge, which also hosts two Cycle Hire stations  Blackfriars station on the City side north bank of the river has been redeveloped as part of the Thameslink Programme and opened a Bankside entrance in 2012. London Bridge and Southwark are the other stations closest to Bankside, located to the east and south of it respectively. It is served by bus routes 381 and RV1 which are hydrogen powered. Bankside Farmers - A group of five early American colonists originally resident in the Bankside district of London. ^ Gillian., Tindall, (2007). The house by the Thames : and the people who lived there. London: Pimlico. ISBN 1844130940. OCLC 73956885. ^ "Land Securities London Portfolio - Bankside 1/2/3, SE1". Land Securities. Retrieved 7 August 2013. ^ "Where's your community council". Southwark London Borough Council. Archived from the original on 4 March 2012. Retrieved 4 September 2010. ^ "Bankside Mix tops the league on first day of Barclays Cycle Hire [2 August 2010]". London-se1.co.uk. Retrieved 2015-07-24. ^ "RV1 hydrogen bus fleet off the road due to the Olympics [21 July 2012]". London-se1.co.uk. Retrieved 2015-07-24.